The Interactive Advertising Bureau is getting behind the push to make the mobile Web more user-friendly through a new site providing tools for publishers to improve their mobile presence. The ultimate aim is to boost mobile advertising and m-commerce by expanding the number of sites designed specifically for mobile devices. 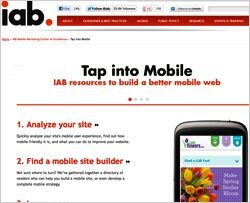 The IAB’s “Tap into Mobile” site will offer a digital dashboard allowing publishers and businesses to analyze their sites’ mobile user experience and access mobile guidelines, best practices, case studies and data points. It will also provide a directory of mobile developers and agencies to help companies develop mobile strategies and leverage mobile as part of the marketing mix. The IAB created Tap into Mobile in cooperation with Google’s “GoMo” program, launched last year with the same goal of promoting mobile expansion and helping businesses create mobile-friendly sites. Last August, Google said 79% of its top advertisers lacked mobile-optimized sites, limiting their business opportunities on handsets. A new analysis of Fortune 500 mobile sites by the IAB conducted in relation to the launch of Tap Into Mobile found that only 45% had mobile-specific sites. “The fact that almost half of the Fortune 500 don’t have mobile-focused sites points to a critical disconnect -- and considering these are major corporations, we can only imagine how many smaller businesses are in dire need of a mobile upgrade,” said Anna Bager, vice president/general manager of the IAB’s Mobile Marketing Center of Excellence. The IAB and Google mobile initiatives will have links to each other’s sites to broaden their reach. Even without more mobilized Web sites, the IAB estimates mobile ad spending in the U.S. more than tripled to $1.6 billion last year. In a new study released this week, the trade group estimated global mobile advertising at $5.3 billion in 2011.